We teach that the patient needs to understand "the net treatment benefit for the patient." We call this the Treatment Score. You must consult your own licensed medical doctor for all your healthcare needs, including diagnosis, treatment, and for the interpretation of all medical statistics including Treatment Scores. You, as the user, assume the sole risk, and all risks, for making use of, or relying upon, the information, calculators, or other materials on these websites, or wherever you find our information. We are not responsible if your licensed medical doctor does not understand medical statistics or Treatment Scores, or if any patient, doctor, nurse, reporter, blogger, and so on does not understand medical statistics or Treatment Scores. You must consult your own licensed medical doctor for all your healthcare needs, including diagnosis, treatment, and for the interpretation of all medical statistics including Treatment Scores. The information on our websites, or related documents, should never be used as a substitute for the advice of a qualified, licensed medical doctor. Treatment Scores, LLC (and anyone affiliated) are not responsible for what anyone does with any information from our sites or documents. 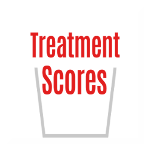 Treatment Scores are for informational purposes only. Treatment Scores may be incomplete, inaccurate, harmful, or even cause death if used for treatment instead of consulting a licensed medical doctor. No medical advice is being given. We (Treatment Scores, LLC or anyone affiliated) DO NOT CLAIM to cure, treat, or prevent any illness or condition. Nor do our services provide medical advice or constitute a physician patient relationship. We do not form physician-patient or doctor-patient relationships. Contact your physician if you suspect that you are ill. Call emergency services (call 911 if available) or go to the nearest emergency room if an emergency is suspected. We are not responsible for any delays in care from using our websites, or any information obtained from our sites, nor for any consequential damages of any nature whatsoever, either directly or indirectly related to our websites, our information, or from assumptions made. We make no warranties or guarantees of any kind. We cannot predict the future. We give no advice, and make no predictions, for what might happen in the future for you or anyone else that might undergo any type of treatment. We claim ZERO accuracy with Treatment Scores. We claim zero accuracy, because in medicine every patient is different, almost every statistic is a flawed statistic in some way, there are almost always estimations, and there is almost always bad or missing data. Averages may be used and no patient is average, every patient is unique. SEE YOUR OWN LICENSED MEDICAL DOCTOR FOR DIAGNOSIS, TREATMENTS, AND FOR UNDERSTANDING ALL MEDICAL STATISTICS INCLUDING TREATMENT SCORES. This website, or any of our information, should never be used as a substitute for the advice of a qualified, licensed medical doctor. We are not advocating any treatment, physician, medication, or anything but education. We are not saying any treatment is better than any other treatment for you or anyone else. We are informational only. Contact your licensed medical doctor for medical treatment, diagnosis, and for explanations of all medical statistics. We claim 0% accuracy for Treatment Scores! The accuracy and certainty of all medical information is to be decided by your licensed medical physician and yourself during informed consent and shared decision-making. We claim zero percent accuracy for Treatment Scores™, Treatment Grades™, and Science of Medicine (SOM®) Scores and grades! Let us repeat that for emphasis, we proclaim ZERO ACCURACY! Why do we make such a statement? It’s because medical decision-making is so complex. We claim zero accuracy, because in medicine every patient is different, every statistic is a flawed statistic in some way, there are always estimations, and there is always bad or missing data. Individual results may vary. We do not claim to be a standard, guidelines, or a medical study. We make no claims. We do not recommend any treatment, therapy, device, medical provider, or any kind of medical professional to you. We cannot tell you if any treatment is safe. We cannot tell you if any treatment is FDA approved. Safety is your responsiblity and that of your medical doctor (physician). We cannot tell you if any treatment has been deemed to be safe and/or effective by any other entity, public or private, or by any private or government institution. You must ALWAYS look up safety issues yourself, and discuss safety issues with your licensed medical doctor. All of these things are your, and your physician's, responsibility. Individual results may vary. You must protect your own privacy. We have no idea if you’re looking up medical information for yourself, for someone else, for informational purposes, or for any other reason. Do not give us any information, or post any information, that you do not want to be public. Do not put up any private health information if you want it to remain private. Do not claim to have any disease or illness unless you want to do so voluntary and are willing to lose your privacy and confidentiality; you do so at your own risk. Do not violate any medical confidentiality laws for yourself or others. Users can be terminated at any time with cause for any reason. Abuse, spamming, and defamation are not allowed. You consent to arbitration rather than initiating a lawsuit if any dispute arises. You consent to the exclusive jurisdiction of the state of Florida, the city of Sebring, and the county of Highlands County, Florida, to the fullest extent possible. We and all affiliated parties, in any event, shall not be liable for more than $100 in the aggregate for any claim against us for any reason. The $100 amount shall be in lieu of all other remedies. If any provision of this shall be held to be invalid, be deemed to be invalid, or be invalid, or is not enforceable by Treatment Scores, LLC or affiliated parties as intended, because of any law, regulation, or ordinance, that provision shall be redone by Treatment Scores, LLC as to be valid, and all other provisions shall remain valid. One or more flaws shall not negate the intent of the entire document. Disclaimers regarding MEDLINE and PubMed. The National Library of medicine is abbreviated NLM. Our websites sometimes use the National Library of Medicine (NLM) as sources. It is our understanding that to satisfy NLM use requirements a link to the source on MEDLINE®/PubMed® can be posted. Per NLM licensing, we want to be known in a “clear and conspicuous manner” on behalf of the NLM that we are not claiming to keep our references up to date from MEDLINE®/PubMed®. The dates of all abstracts and related data files from MEDLINE PubMed can be found within their database. Everything original on our websites is Copyright (C) Treatment Scores, LLC. All rights reserved. You may not create derivative works from, modify, copy, distribute, transmit, display, reproduce, use, publish, license, transfer or sell any content contained on this site without permission to do so. We maintain all rights to all our intellectual property including copyrights, trademarks, and trade secrets.